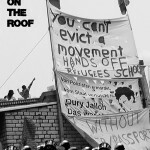 In december 2012 refugees occupied an empty old school in Berlin-Kreuzberg. 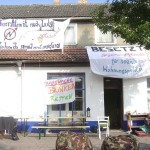 Now the green government of Berlin- Kreuzberg want to evict the 50 still remaining refugees.The ultimatum to leave the school voluntarily ends on october 31 friday, 2014. A violent eviction now is very much possible. According to a statement from squatters in the ZAD of Notre-Dame-des-Landes, during the night between Saturday and Sunday the 26th of October 2014 a protester named Remi was killed in clashes that broke out after a rally against the construction of a dam along the Sivens forest in the wetland of Testet in the Tarn department (southern France). 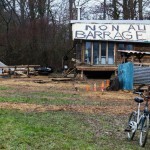 Around 7000 people gathered in the ZAD (zone to be defended) of Testet, after months of police attacks and destruction of the wetland and habitations of those who defend the area. In the late evening and overnight, dozens of people attacked the forces of order that were protecting the dam construction site. Activists expressed their anger trying to delay the resumption of works, originally scheduled for Monday the 27th of October. 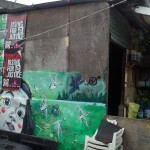 Le Transfo has been opened in November 2012 as a big squatted social centre, with four buildings (one for inhabitation and three for activities). 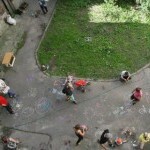 It was an autonomous and anarchist space. More info, here, in French. 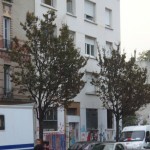 This morning, Thursday October 23rd, 2014, at 6am, the eviction of le Transfo has begun. – 6:00am : The cops enter the squat destroying a barricaded window on the ground floor with an excavator ! – 6:10 : The inhabitants get controlled by the police. – 6:20 : Hundreds of policemen control the neighbourhood, blocking the street on both sides. Lots of police vans are parked in the street. 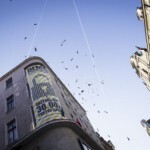 Warsaw (Poland): Syrena means struggle! The city government of The Hague wants to evict social center De Vloek on January 5, 2015 to make room for a sailing center. 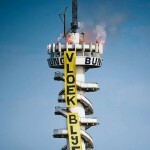 Located in the harbor of Scheveningen, De Vloek was squatted 12.5 years ago and meanwhile has grown to be an essential social space in the harbor. There is already enough space for sport sailing in the harbor, but De Vloek must nevertheless move aside for the latest prestigious real estate project which nobody is looking forward to. 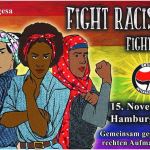 On the 30th of september 2014 a diverse group of people has squatted a historically important builiding near the center of Greifswald, north-east Germany. 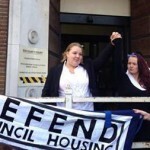 Despite Newham Council’s attempt to evict us, we can today confirm that the E15 Open House occupation will continue until 7th October as planned.